Slightly outweighing its contemporary descendant, the seven-pound Goliath Frog of Equatorial Guinea, Beelzebufo was the largest frog that ever lived, weighing about 10 pounds and measuring nearly a foot and a half from head to tail. Unlike contemporary frogs, which are mostly content to snack on insects, Beelzebufo (at least by the evidence of its unusually wide and capacious mouth) must have chowed down on the smaller animals of the late Cretaceous period, perhaps including baby dinosaurs and full-grown "dino-birds" in its diet. Reprising a common theme, this prehistoric amphibian evolved to its giant size on the relatively isolated Indian Ocean island of Madagascar, where it didn't have to deal with the large, predatory, theropod dinosaurs that ruled the earth elsewhere. 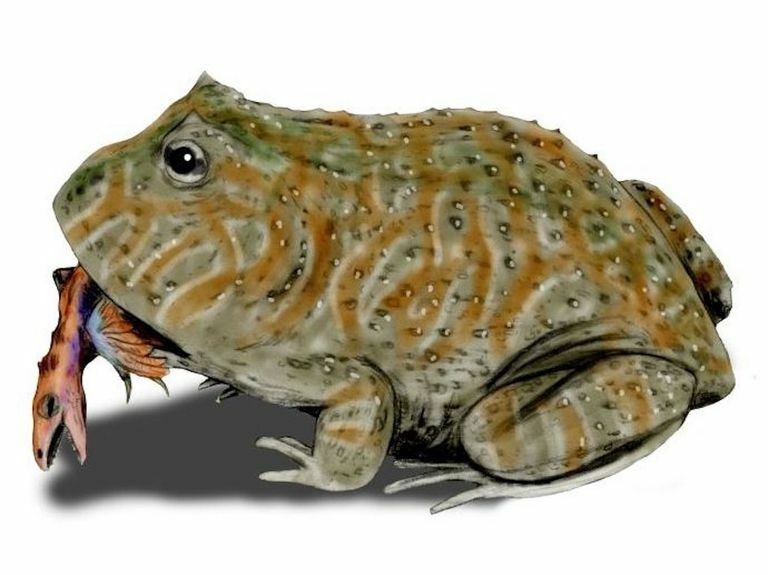 Recently, researchers investigating a second fossil specimen of Beelzebufo made an amazing discovery: as big as it was, this frog may also have sported sharp spikes and a semi-hard, turtle-like shell along its head and back (presumably, these adaptations evolved to keep the Devil Frog from being swallowed whole by predators, though they may also have been sexually selected characteristics, the more heavily armored males being more attractive to females during Devil Frog mating season). This same team also determined that Beelzebufo was similar in appearance to, and perhaps related to, horned frogs, genus name Ceratophrys, which today live in South America — which may hint at the exact time of the breakup of the Gondwanan supercontinent toward the end of the Mesozoic Era.